Back in April, we ran a competition in association with Melia Hotels International. The winner won a two-night break at the European Melia property of their choice. Thanks to winning the very first competition on Head for Points, we booked a 2 night stay at the luxury urban resort, the Gran Melia Hotel in Rome at the end of July. Firstly, we must thank both Rob (aka Raffles) and Gianni (from Melia) for the prize. I can certainly say it surprised my wife on her birthday! She was utterly gobsmacked. We arrived into Ciampino Airport in Rome around 8pm on the Friday night courtesy of a low cost airline (didn’t have enough Avios). To get to the city centre, we had booked a Terravision bus direct from the airport to Rome’s Termini railway station for 8 Euros. 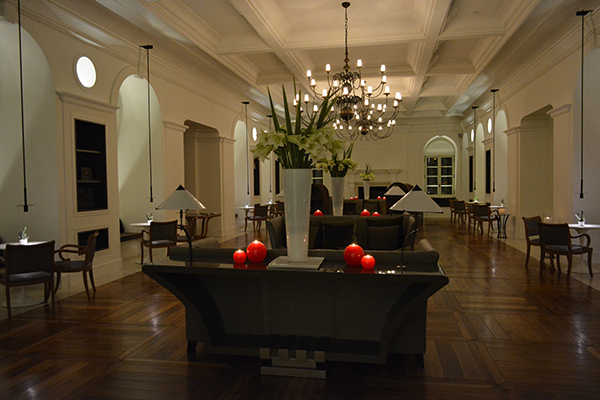 The next task was to grab a taxi and take us to the Gran Melia. The taxi cost us around 20 Euros, but we did tip the driver as he gave us a great introduction to Rome on the way. This got our city break off to a great start even driving us past The Vatican, telling us about The Pantheon and the Piazza Navarro. On arrival at The Gran Melia we were greeted by the Concierge who took our luggage for us. On the left are the magnificent Orti Domiziani Gardens and the right hand side is the pool area and a bar area. The concierge took us to reception. We were checked in by Marisa and she asked if we would like a free glass of Prosecco. We accepted and we were taken to the Liquid Lounge, an outdoor bar area near the swimming pool. Once we had finished we returned to reception and Marisa took us to our room. The hotel staff are very friendly and welcoming. 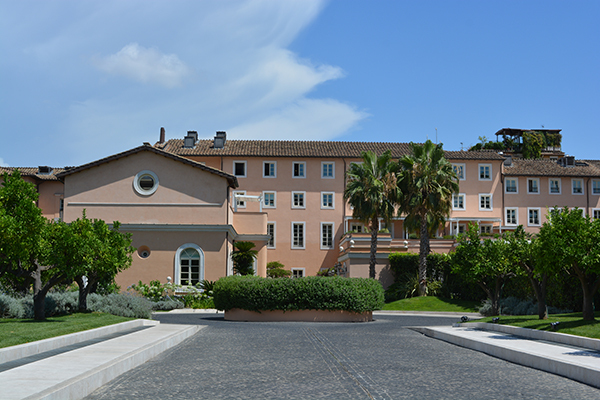 Our room was one of 116 rooms in the hotel, built on the former home of Agrippina, the mother of the Emperor Nero. My wife liked the idea of the lights illuminating the room number on the floor! We had a Deluxe Room with shower and double bed. Interestingly, only a blind separated you from the bed to seeing through the shower to the bathroom. Just to see how close we were to the Vatican we went for a walk around 10pm and can safely say that within 10 mins you are viewing the Vatican at one end of the street and the Castel Sant’Angelo at the other. Be aware of the steep hill climb back to the hotel though! On the Saturday morning, we decided to try out the breakfast buffet with the usual continental breakfast, cereal, yoghurts and fruit. There was no toaster so we had to specifically ask for some toast. Tea and coffee was offered and we were greeted to a “Good morning Mr & Mrs XXXXX” which was a nice personal touch. Shortly after breakfast, we chose to walk to the Vatican to collect our OMNIA & Roma Passes. The OMNIA Pass allows access to St Peters Basilica and the Vatican Museums by queue jumping in groups. Given the long queues, this was a big advantage! A short walk down from the Vatican allowed us to hop on the Roma Christiana bus (the yellow buses) and a bus tour of Rome. We decided to stop off at the Colosseum and the Arch of Constantine. We can honestly say this was awe-inspiring. With the Roma Pass we again queue jumped and even though the queue outside was not very long, it was the deceivingly long windy queues inside that would take a good hour to get in. Next up was the Roman Forums and Palatine Hill. We walked through the ruins of Ancient Rome and down to the Vittorio Emmanuel monument. It was just before 6pm and we had walked far and visited 4 of the major attractions in Rome. With the last bus leaving the Vatican at 6pm, we opted for a taxi back to the hotel to save our weary feet from climbing the steep hill back to the hotel. 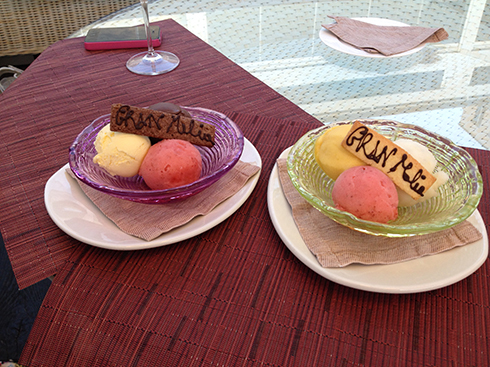 On arriving back at the hotel, we decided on resting in the Liquid Garden bar area with not one but two bottles of Prosecco and some bar food with ice cream and sorbet (photo below). We could have eaten inside but the comfy outdoor sofas were too inviting after a long day walking around Rome. So comfy that we left around 4 hours later after a relaxing evening. 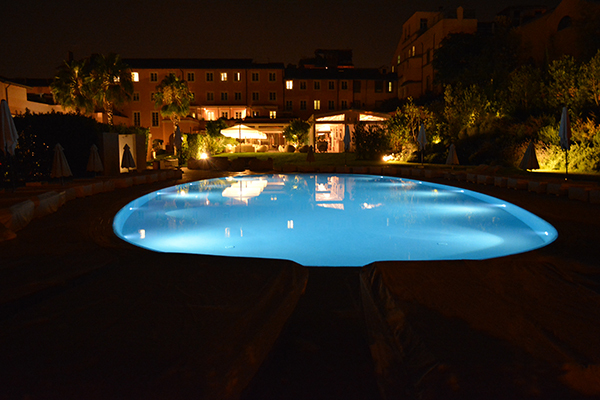 The hotel itself is peaceful, quiet and the magnificent Orti Domiziani Gardens are beautiful. This would be a great place for wedding photos. On the Sunday morning we opted not to take breakfast in favour of a lie in, although we had to check out by 12pm. We went for a stroll around the grounds, the gardens are beautifully landscaped and the pool (below) looks inviting with numerous sun loungers and a few four poster loungers. You might need to grab a sun lounger early if you wish to use the pool. Both mornings we were there all loungers were taken. There is a YHI Wellness Spa offering many treatments for those wishing to relax and unwind. We left our luggage with the Concierge to allow us to some more exploring and went to Castel St Angelo. The view from the top gives you a bird eyes panoramic view of Rome and the Vatican. This place is worth a visit. If you don’t have a Roma Pass, it is 10 Euros or so to get in per person. After a few hours here we went back to the Gran Melia to collect our luggage and move to a night at The Westin Excelsior. The Westin Excelsior was a free night for us courtesy of some SPG points. On arrival we were upgraded to a King Bedroom on the 5th floor thanks to my Platinum status. We opted for some lunch in the art deco themed ORVM Bar to have a rest before going out to the Spanish Steps and the Trevi Fountain. Currently there is some renovation work at the top of the Spanish Steps and around the Trevi Fountain so this was somewhat disappointing. On returning to the Westin, we collapsed back in the ORVM Bar for more drinks and food. The next morning, we asked the concierge for a taxi to Termini Railway Station to get the Terravision bus back to Ciampino. I can safely say that turning up as per the instructions, 15 mins prior to boarding to collect boarding passes, is a waste of time. The queue was horrendous. So, we opted for a 30 Euro taxi direct to Ciampino. If in doubt or in a hurry, grab a taxi as they are fixed prices to the airports! All in all, we had a delightful stay in Rome thanks to Head for Points and will return when we get the chance. You have NEVER seen a safety video like the Virgin America safety video! My review of the Four Seasons Las Vegas hotel - is it worth the splurge? Thanks for the tip about the Omnia Pass. The queues were horrendous the last time we went to Rome about 15 years ago. We must go back and see the Vatican Museum rather than the queue; look out for the interwoven spiral staircases. Omnia Pass (€95) is quite a rip-off. The basic Roma Pass which gives the same city (not Vatican) access to museums, sites and public transport is €36 and you can book Vatican tickets online for €20 (never just turn up and never go on Monday). Rome’s bus system is extensive, reliable and very easy to navigate. Glad Nick had a great time – Rome is endlessly fascinating but not great for earning avios!